Could there be a Bromley Healthy Ride to Teapot Island? 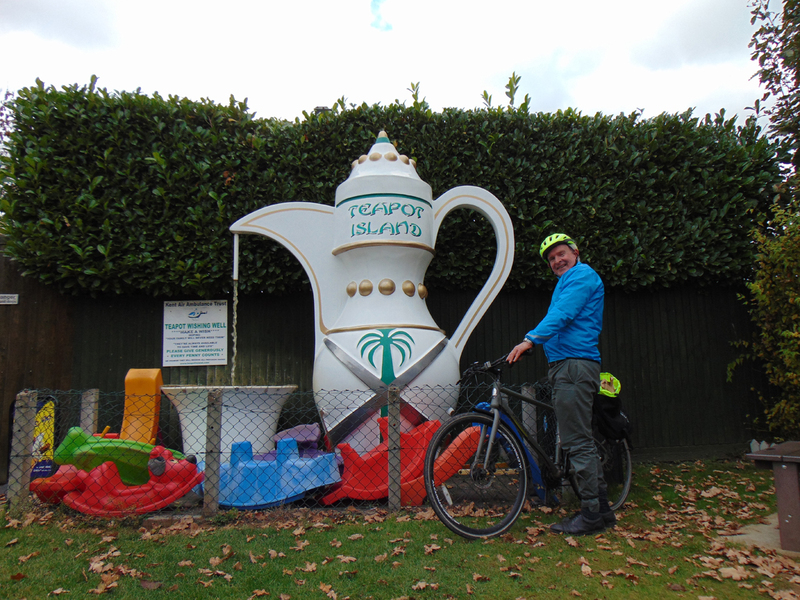 This reminded me that Teapot Island is only a few miles Hadlow, which we visited on our Good Friday Otford to Tudeley ride. So I thought can I prove that it is possible to cycle there, without wearing branded cycling kit, as would be the case if arrangements could be made for this ride to be done as a Southwark Healthy Ride? So I set off to find a train for Orpington, which I thought would be a good starting point for the ride. The idea of doing Orpington rides is of particular interest to me, as there used to be a thriving Orpington Pedal Pushers cycling group on letsride.co.uk a few months ago, but it mysteriously disappeared as soon as I threatened to join one of its rides! When I found that I was going to have to wait half an hour at West Dulwich station, I decided I would cycle to a station two stops further along the line. When I checked where the Dulwich train was going to, I was amused to discover that its route took it to Penge East station, so what is where I boarded it! Fortunately, I now know that cycling over Crystal Palace Hill is by far the quickest way to get around SE London and that the toll gate/College Road route is not all that steep, When I reached Orpington, I then started the ride to Teapot Island via Halstead, Sevenoaks, Knole House and Hadlow. It only took a few hours - probably not much longer than it would have taken me to drive there from north London! It reminded me of the story of the hare and the tortoise - just because I don't wear lycra doesn't mean I can't do long distance cycling! I saw lots of lycra cyclists on route, but noticed that they all have to get back by lunchtime because it is too cold and tiring for them to stay out all day. On my way back I took the opportunity to cycle to Tunbridge Wells, which is a place I have always wanted to visit and which is only a few miles from Teapot Island. There is a very good, fast, frequent rail service that took me back to London Bridge. This experience gave me a mission: why don't I try to get Southwark Cyclists to affiliate to British Cycling, as Penge Cycle Club have done? Southwark Cyclists could then have public liability insurance for doing rides like this, rather than have to spend all their time doing short rides in an around Southwark mainly for novices and older people. The ride turned out to be 40 mile ride rather than 30 miles for the Ophelia one, but I did have to use trains to get to Orpington and to return from Tunbridge Wells. The ride was much more interesting than the planned Hogsmill one, but the use of trains mitigates against using rides like these to form a cycling group. On rides like these, everyone disappears to their homes after the ride, so it is important to mix rides like these with shorter rides, where people can return to base to have discussions.